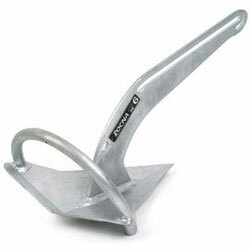 Introducing the Rocna, the ultimate solution to your vessel's anchoring needs. A Rocna always attains its correct setting attitude for quick penetration, regardless of how it hits the bottom. It digs straight in, offers superior holding-power, and will not easily trip out on load reversal. Rocna represents the best in safety, security, and dependability. Designed as a specialist anchor for fishermen and divers who re-anchor frequently during the day, the Rocna Fisherman Anchor features a shackle rail for easier recovery of a fouled anchor.